Nautika is a spacious apartment which is fully owned and managed by the owner who takes pride in the presentation and inclusions in this property.The apartment is on the top floor of a modern quiet apartment complex overlooking the harbour and the CBD. Its just minutes from the Waterfront Precinct, wave pool and convention centre and is centrally located for all Darwin's major attractions. Bayview is surrounded by beautiful tropical landscaped gardens, walking and cycling tracks, parks and water views. Bayview is a beautiful modern Marina suburb approximately 1km from the Darwin CBD. Modern tropical style homes with beautifully landscaped gardens surround the Marina together with parklands, walking and cycle tracks. There is a regular public bus service from outside the complex to the Waterfront Precinct, CBD and Cullen Bay with connections to all Darwin suburbs and main Darwin attractions. A well appointed apartment with the little extras that make a big difference. 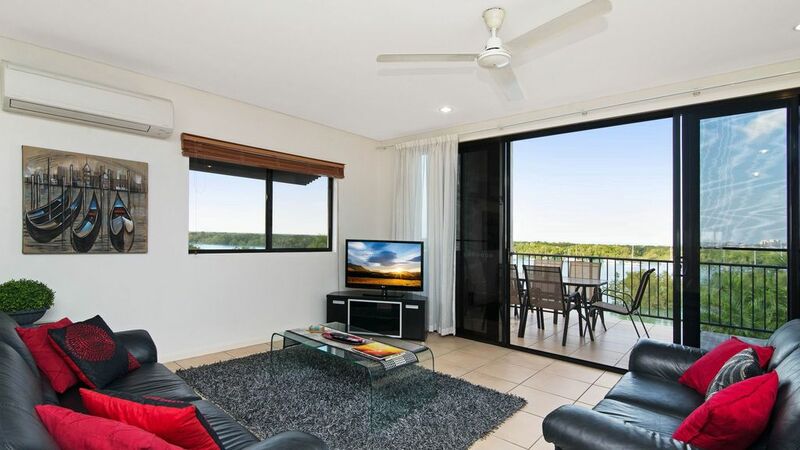 Quality furnishing and a great balcony to relax and take in the Darwin City views. Owners go that extra mile in providing an appreciated welcome pack and a selection of great coffee (Nespresso). Located in Bayview just outside the city centre. A good walk into town (25-30mins) along well established footpaths, great little restaurants in Bayview with Frying Nemo a must visit (~ 2kms from apartment). You will npot be disappointed an dwould definitely book here again for next Darwin trip. Thnak you Jan. Thank you so much for your review - it was a pleasure hosting you and I look forward to your return! The owner of the apartment aimed to ensure his guests had a relaxing and enjoyable stay. The bedrooms are well fitted out with modern bright linen, comfortable beds and storage. The kitchen was well fitted out and the family room overlooking the bayviews and city lights at night is very relaxing especially on the balcony using the barbeque for dinner. The lock provided much interest in its operation and access to the marina. My family would enjoy staying in the apartment again. The apartment had everything , another home away from home. It had a pantry stocked with supplies, a fridge with milk, butter, wine, chocolates and more. The beds were comfortable, bbq, TV, internet, a large living area with balcony,the list goes on and Jan was there to welcome us and show us around the unit on arrival, a great place to stay. Stunning, Modern Apartment With Magic Views ! Our family thoroughly enjoyed our stay in this stunning, modern apartment, very tastefully decorated with magnificent views. We stayed for 8 nights as my son was competing in the National Swimming Championships in Casuarina. We arrived in the middle of the night and the owner had gone out of her way to make our stay special by providing everything we could possibly need for breakfast the next morning- including a bottle of wine and a huge block of chocolate in the fridge ! The apartment was exceptionally comfortable even on days of over 45 degrees with air-conditioning and fans in every room, beautiful reclining leather lounges, a lovely modern kitchen with everything you could possibly need, coffee pod machine, and a nice outdoor setting and BBQ on the balcony overlooking the harbour which has the most amazing tides and sunsets. We have never experienced hospitality anywhere like this ! Thank you Jan !!! Thanks Nola, it was a pleasure having you all - hope to see you back for the Darwin Cup next year! The apartment has everything you could possibly need and so much more. The view is truly spectacular day and night. The location is out of the city itself, but quiet and just a short drive or bus ride away from city, markets, casino etc. The perfect getaway home away from home. We absolutely loved our stay there and would definitely recommend it.